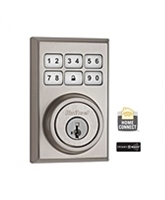 The SmartCode Deadbolt with Home Connect Technology featuring Z-Wave enables the door lock to wirelessly communicate with other devices in home. The lock allows the user through a web enabled device to remotely check the door lock status, lock or unlock the door and receive text or email messages. Upgrade to a more convenient, more controllable keyless entry deadbolt with SmartCode™ Signature Series. You also get more control over who has access to your home. Just assign a temporary code to whoever needs one and delete it when you see fit. Now you can totally eliminate the need for keys. SmartCode is easy to install, program and use and operates on 4 AA batteries. 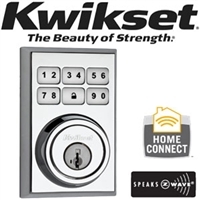 SmartCode complements any Kwikset knob, lever or handleset. The SmartCode Lever with Home Connect Technology featuring Z-Wave enables the door lock to wirelessly communicate with other devices in home. The SmartCode Leverset with Home Connect Technology featuring Z-Wave enables the door lock to wirelessly communicate with other devices in home.